A little over a year ago my girlfriend Lisette and I moved in together. A big part of living together was getting used to managing a budget, and knowing where our money went. 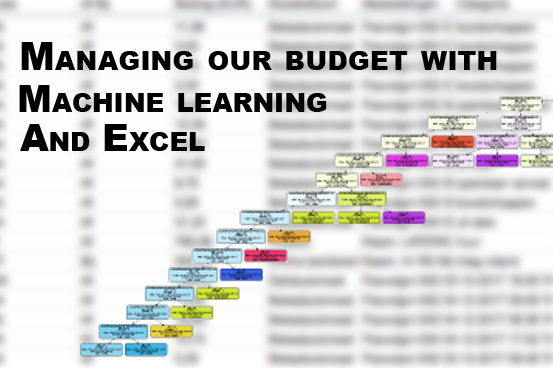 Lisette made one of the coolest Excel spreadsheets I ever saw, the only thing we needed to do was… actually fill in what expense belongs to what category. This is where things went wrong…Every month we have about 100 shared expenses, and labeling them turned out to be a boring job we both didn’t want to do (and thus ignored for the last 10 months…). Last weekend I made an attempt at automating this task using the power of machine learning! The first step to training a classifier is getting your training data! My bank gives you the option to download a spreadsheet with all (unlabeled) expenses. I imported this into a Google spreadsheet and added two columns: one with my own (optional) labels and one for the computer-generated labels. Although writing a classifier in Excel is probably possible I used Python with the NLTK and SKLearn library. To do this I needed to get all transactions and labels I added in my Jupyter Notebook. Thanks to Greg Baugues this turned out to be surprisingly easy! His blog post was a great help, and made this process pretty smooth. For each transaction, I made a feature vector with a boolean for each of the most common words in the transaction. I made separate lists for words in the description, the number of the account money was transferred to, and whether we receive money or not. 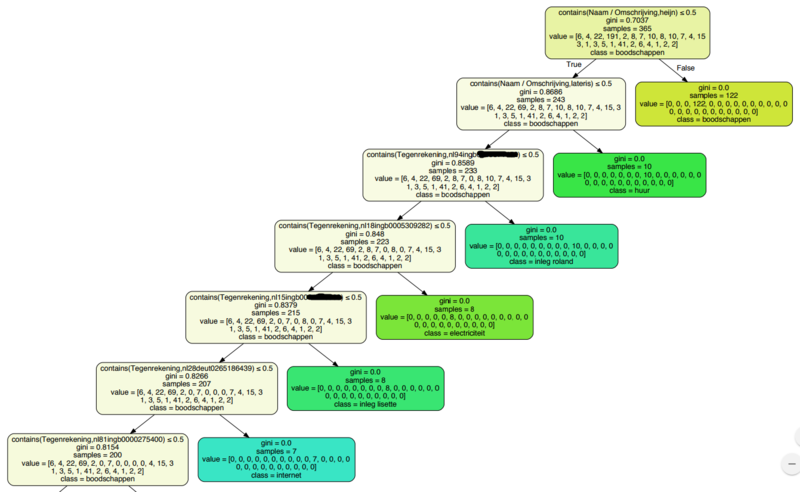 The SKLearn tree classifier has a function to write the decision tree as a graphviz file. This function requires the classifier NLTK created, the feature names, and the class labels. Getting these required a bit of documentation reading as there are no clear functions to get these (and there is no way to know what the classifier did with your data). Eventually, the following code was able to get what I needed. Python can even write the whole tree itself if you install and import the graphviz library. Below is a part of the decision tree the algorithm generated. It correctly discovered that I do my grocery shopping at the “Albert Heijn” (https://www.youtube.com/watch?v=GiZJa_Ctkr4), where I rent my apartment, where my internet money goes to, and much more! And now the most important part of this project: classify each of my transactions! As described at the start of this article I added a column for the computer prediction. The Google Sheets API allows you to write a single cell at a time which for some reason takes around a second per edit. Although it’s annoying if you try to iterate quickly, it gives some cool visualizations while your algorithm is working! Although not everything is filled in correctly, about 80% of my transactions are now correctly labeled! It saved me a lot of time, was an interesting challenge, and makes the awesome Excel sheet way more usable now. 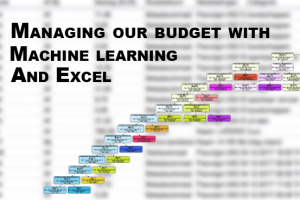 If you are interested in the code, it’s available on Github: https://github.com/rmeertens/python_budget_classifier . I always love to hear feedback from people so please reach out to me! Looks interesting. The main issues I see in understanding the method are: 1) where did you make the “vector of booleans”? 2) IMHO, non-English terms make very difficult to understand the results to non-native language readers.